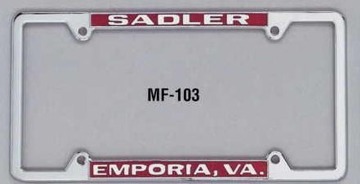 Custom Metal License Frames Personalized in Bulk. Promotional, Cheap, Raised Letters. Best in America. Custom Metal License Frames Personalized in Bulk. Chrome, Promotional, Inexpensive, with Raised Letters. Budget Prices in America. Wholesale custom chrome plated metal license frames with raised letters. Lowest prices in USA and Canada for bulk custom chrome license frames! American clients pay no taxes. When a quality image is what you are looking for, look no further, our High Quality Chrome Metal Frames are one of the finest that you will find produced on this planet. Each die is polished to a beautiful finish. We then use the finest zinc material available, chrome plate them and finish them off with the best paints available. Truly, a metal frame in a class of its own. We supply chrome license frames, brass license frames and black metal license frames of different styles: see the pictures. The price of our metal license frames does not depend on style: you may chose any style. All our metal license frames are made of very sturdy chrome-plated zinc alloy. Free artwork design. We will send you a proof for your approval before production. Motorcycle Chrome Plated License Frames are also available: same price. TYPICAL PRODUCTION TIME: 7 weeks for imprinted frames; 1 week for blank (not imprinted) frames. The 2-color imprint prices include one background color of your choice (free PMS match!) and a different imprint color for the letters and/or logo. No Setup Charge for quantities of 1000 or more, or for repeat orders.